“I slump chilled on a London street bench as the sun sets, uncertain of my choice. A string of lonely decisions, this is just one more—maybe the last! I can stay through next week; or I can change my flight to leave tomorrow. Each costs three hundred dollars. The cost will not make the decision for me. There is a loneliness I walked this month of May—arms swinging, knees advancing, feet trekking, carrying the weight of these motions into the world. Unlike the motion of a ship, this effort lands on solid surface, grounded in space. The heel to toe touching earth, then lifting in space, while the other foot lands and creates a solid awareness that only I can make this movement—no one else. A soft padding rhythm in the grass makes the sound of one’s own feet in motion—of someone approaching from a nearby place within. While writing my memoir, I recognized my travels as a young girl developed self-reliance, decision-making skills, and confidence. Travel experiences instilled in me a sense of “agency;” I could determine what I wanted in my life and make it happen. DESCRIPTION: The book weaves several story lines together as it 1) praises her mother who launches Rhonda into the world prepared; 2) credits her church for sending her onto the mission field with a Christian foundation; and 3) traces Rhonda’s steps as she grows up into a world citizen and eventually grows away from her small town roots and even her church. The book is a coming-of-age travel memoir that tells about growing up in rural Arkansas delta with a mother who wants more for her. The world of a ten-year-old girl in 1963 sets the stage for where she comes from and who she is. Then follows her travels within the U.S. and its multiple cultures, as well as abroad, until she is twenty-seven. Rhonda savors various worlds through mission studies and missionaries, who visit her church. Rather than narrowing her views of the world, her church experiences expand her world, and in turn, her worldview. Her mother, wise beyond her own experience, discerns that travel is fundamental to growing up with options and launches a fledgling daughter into the world. 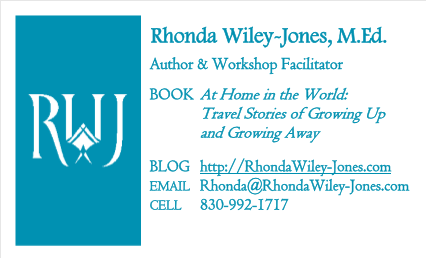 Each journey into the world whets Rhonda’s appetite for learning more about people and geography, ideas and culture. Traveling, usually alone, marks her growth chart at ages fourteen, fifteen, seventeen and during her college sophomore year. Rhonda travels alone on her first train trip across the state of Arkansas, then soars across the Atlantic to Europe for a world youth conference, and jets across the Pacific to Hawaii to work with an island church in a multicultural maze. She then transfers from one college to another to spend a year in a Mormon-dominated culture, while working as a Southern Baptist missionary in Salt Lake City. Rhonda’s church upbringing and mother’s mentoring result in opportunities and growth. Neither her church nor mother expects the evolving outcomes inherent in her journeys. She emerges—a young woman traveling solo in the United Kingdom and Ireland at age twenty-seven. Her intent is to achieve a new level of independence and in the process takes stock of the self she once thought she wanted to be. The breaches discovered in her self-assessment, in the belief she once had in her church, as well as her view of the world, stand in stark relief against her expeditions. This declaration of independence coincides with her departure from the church that she has loved and has given her so much. Rhonda grows up and grows away to find herself at home in the world, due to collective contributions in her life—her mother’s tutelage, the church’s influence, geographical and ideological travel, as well as time spent reflecting on what she has experienced. Today I’m writing a historical fiction book (working title, Salwar Kameez). An unconventional, horsewoman, Fiona Weston, travels to India in 1906 to sell quarter horses to the British Indian military to breed with their polo ponies. She loses her brother in the San Francisco earthquake on the way and wrestles with her grief in an unsettling situation in which the ship’s crew views her as a hex on the voyage. When she arrives in India, Fiona explores a new culture while discovering romantic encounters with two competing men. She finds herself at home in the world, navigates a sensuality she never knew to expect, and chooses to live with grief while looking forward, not back. 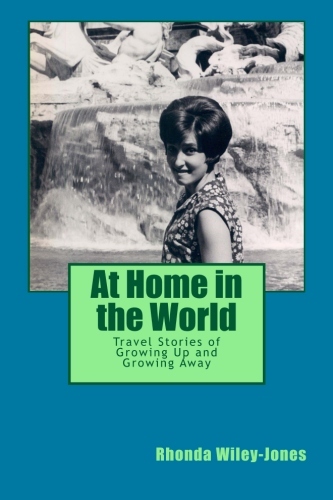 You will find other pieces of Rhonda’s travel writing stories under “BOOK” and “ONLINE PUBLICATIONS” menu items. Enjoy!